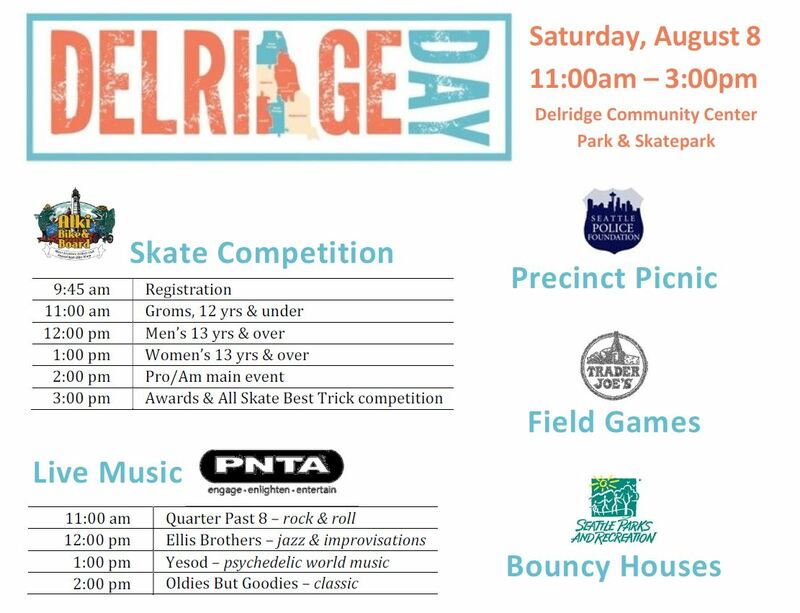 While building out this website and a history of the event — hover above for a dropdown menu — VieWS discovered that this year actually marked the 10th anniversary of the Delridge Day event – it began on June 24, 2006 – so that gave us the incentive to work hard to make it even bigger and better than before. We’re pleased by the return of many of the local businesses and community organizations who have showcased their services in the past; and excited by the new friends who joined us for the first time to build up our Delridge community! Alki Bike & Board was back hosting another truly awesome and entertaining competition at the Skate Park! The skate competition was longer than the festival, with registration beginning at 9:45am for a chance to show off skills and win some cool cash and product prizes for competitors of all ages! With the continuing support of The Seattle Police Foundation, the Southwest Precinct Picnic came back for the third consecutive year. The Seattle Police Department brought cars, their mounted patrol (that happen to be based right here in our Delridge neighborhood), Bomb Squad robots, free ice cream and popcorn, and more. We even have a visit from SPD Chief Kathleen O’Toole for the second year in a row! There’s always a big day planned for families. Volunteers from Trader Joe’s were back again to lead picnic games and plenty of fun activities to keep kids and adults alike entertained — including Mayor Ed Murray, who stopped by to participate in the potato sack races! With plenty of prizes on hand, everyone was a winner! Our music stage featured a great lineup of local live music and entertainment as always, with many favorites returning. The day kicked off right at 11am with some rock & roll by Quarter Past 8. At noon the Ellis Brothers took the stage to show off their jazz & improv skills – and how much this band of brothers have grown since last year! At 1pm Yesod delivered some psychedelic world music — with a couple of belly dancers joining in for a performance! Finally, attendees grooved to the classics as the Oldies But Goodies closed out the festival with the final slot at 3pm. The VieWS planning committee would like to give a shout-out to our Festival Sponsor, Seattle City Light. We also want to recognize our Feature Sponsors (and neighbors! ): Nucor Steel, PNTA, Seattle Parks & Recreation, and Straight Blast Gym. Without them, our other sponsors, and all of our volunteers, none of this would be possible! The sponsorship and vendor fees not only support the festival but also allow us to give back to the community, as VieWS continues the tradition of donating a percentage of all fees to the ARC (Associated Recreational Council), which provides money to fund scholarships for Community Center classes at the Delridge Community Center.